The coming, Herculean effort to build a new, unified nation. 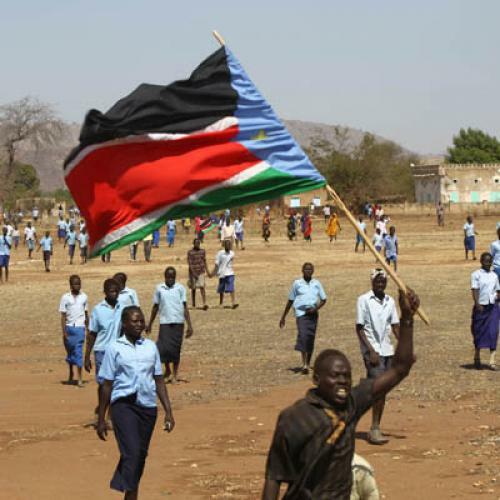 Malakal, Sudan—In the build-up to their historic referendum two weeks ago, all parts of southern Sudanese society united behind one goal: achieving independence from the north. Today, all signs point to this goal having been reached. The referendum’s success shows the promise of the soon-to-be nation of South Sudan: At its best, a diverse people can put their history of inter-ethnic violence behind them to pursue a common national identity. But transforming this moment into something sustainable will be a Herculean challenge for the south’s former rebel group-turned ruling party, the Sudan People’s Liberation Movement (SPLM), which is viewed by ethnic minorities across the south with deep suspicion. At the United Nations office in Malakal, the capital of Upper Nile state, there is a map showing where various ethnic groups live in the south. It is a patchwork of some 40 different colors, but one color dominates: that of the Dinka, a group to which SPLM leader and president of southern Sudan Salva Kiir belongs, as did his predecessor, the late John Garang. In the war years, rebellions against the SPLM by southerners who viewed the group as a pro-Dinka, rather than pro-southern, cause resulted in much south-on-south violence. The legacy of these years remains in the southern psyche. As a result, many minority groups do not view the large proportion of Dinka in the southern government and army as a benign consequence of their numerical majority. Instead, they read it as a sign that one side won the southern war; the pro-Dinka rebel group has now become a pro-Dinka government. And the southern government’s behavior during the six years since the signing of the 2005 peace agreement has not done enough to change this perception. Consider the case of the minority Shilluk group in Upper Nile state. Peter Lualo Lul, a Shilluk leader, told me about the ongoing dispute between Shilluk and Dinka in Fashoda county, which is near Malakal. In many ways, it sounded like numerous other land disputes across Sudan, where there is a seasonal battle over water and grazing rights. Often, these disputes can be resolved between traditional leaders. The difference is that, as this particular dispute grew, the southern army intervened. “The army is majority Dinka,” Lul offers as his explanation for this turn of events. The army’s intervention in favor of the Dinka left Shilluk feeling persecuted by the government. “People believe the Dinka have been using their position in the army to acquire land,” says a UN official familiar with the dispute. Shilluk fears increased following the 2010 elections. Lam Akol, a rebel leader who had fought against the SPLM during the war with support from Khartoum, had formed his own party, which nominated several Shilluk candidates in Upper Nile state. When some of these candidates won seats, the SPLM, viewing them and Akol as proxies for Khartoum, responded harshly. Refusing to accept the election results, the SPLM arrested the newly elected Shilluk politicians. When protests and violence followed, the army moved in. They focused on an armed Shilluk rebel leader, Robert Gwang, who, still today, the SPLM views warily. “Robert Gwang is guiding us. He is keeping us safe from the Dinka,” says Lul. The only way to transcend the mounting mutual distrust among ethnic groups, like the Shilluk and Dinka, is for the southern government to lead by example. It has taken some steps toward this, if belatedly. In October, three months before the referendum, President Kiir convened a south-south reconciliation conference and offered amnesty to dissident militia leaders, including Gwang. The participants also reached an agreement that, if southerners voted for independence, then another conference of all southern leaders, from different ethnicities and political parties, would come together to discuss the constitutional arrangements for the new nation and schedule democratic elections. If Kiir remains faithful to this promise, then he will gain the goodwill needed to tackle the enormous challenges that face the new country. If not, suspicion of the SPLM and Dinka will remain, ethnically charged rebellions will continue to be a consistent feature of southern life, and the viability of the south as a unified nation will be placed in doubt. “As southerners, we should never allow individual interests to override our national interests. Nations are built by people through sacrifice, patriotism, and a common goal,” Kiir told legislators in Juba earlier this week. In the coming months, the question is whether he will translate these words into action.